And so much more. Explore our inventory and find your favorite, then keep reading to see why, for power and performance at a price that can’t be beat, Stingray is the only choice. Affordable Financing: Use our convenient online tools to explore rebates and incentives or stop by and speak to one of our finance specialists about the many competitive financing options available to you. Easy Maintenance: When it’s time to take advantage of your complimentary maintenance services you can trust our state-of-the-art service department and factory-trained technicians to ensure your Stingray’s delicate parts operate just as they were designed to do. Wide Selection: Choose a Corvette or browse one of our more than 900 new or pre-owned options to find the perfect vehicle for your lifestyle. 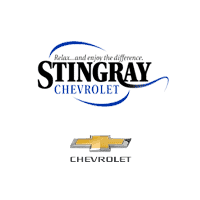 From start to finish the experts at Stingray Chevrolet have you covered. Contact us today to learn more and get started on your next adventure.